A number of wonderful and fascinating YA books arrived in the post this week from Simon & Schuster Canada and Scholatic Books Canada. 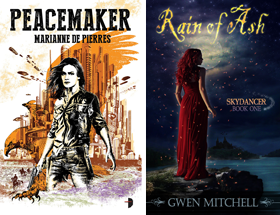 Packaging, artwork, concepts all seem to suggest that YA and teen fiction is bursting with creativity. Here is a profile of this weeks titles. I was particularly impressed with the design of Malice. The books front cover has a metal faceplate not unlike an embossed kids metal lunch box that is very tactile and attention-grabbing. The book itself is a blend of regular novel and graphic novel (see the image below). The Guardian does a nice review here. Visit Chris Wooding's website. SYNOPSIS: Everyone's heard of Malice, but hardly anyone has actually seen it: a comic about a horrifying world of tricks and traps, overseen by the sinister master of ceremonies, Tall Jake. The story goes that the kids who go through Tall Jake’s deadly trials are real kids, who’ve disappeared from the real world and turned up in the comic. But it’s just an urban legend, right? Seth and Kady think so. Until their friend Luke tells them that he’s found a copy of Malice, and the next day he disappears without trace. Seth and Kady investigate, and in doing so, they discover the awful truth. The legends are true. Malice is real. The cover alone makes me want to read this one. The author's website here with lots of great information. SYNOPSIS: For Nora Grey, romance was not part of the plan. She's never been particularly attracted to the boys at her school, no matter how much her best friend, Vee, pushes them at her. Not until Patch came along. Rick Yancey has a terrific website setup to promote the book and in fact for a limited time (until Sept. 30) you can read the entire book online for free! SYNOPSIS: These are the secrets I have kept. This is the trust I never betrayed. But he is dead now and has been for more than forty years, the one who gave me his trust, the one for whom I kept these secrets. The one who saved me...and the one who cursed me. Lips Touch received a starred review in Publishers Weekly. You can visit artist and writer Laini Taylor's website here and her blog here. The book is filled with wonderful illustrations. Goblin Fruit: In Victorian times, goblin men had only to offer young girls sumptuous fruits to tempt them to sell their souls. But what does it take to tempt today's savvy girls? Hatchling: Six days before Esme's fourteenth birthday, her left eye turns from brown to blue. She little suspects what the change heralds, but her small safe life begins to unravel at once. What does the beautiful, fanged man want with her, and how is her fate connected to a mysterious race of demons? With pages of stunningly detailed illustrations by Jim Di Bartolo, these stories are populated with dreaded creatures, transformative beings and more than a dash of the supernatural. Ok you have to like an author who bills humself as Vlad when writing about vampires. This is a fun, tongue in cheek tenn guide to dating a vampire filled with charts, lists, quizzes and advice. Hours of entertainmnet. Love it! SYNOPSIS: Are you in love with a vampire? Are you worried that you might not be his (blood) type? Do you wonder whether that cold stare means he isn’t interested . . . or if it’s because he’s been dead for three centuries (nothing personal)? Have you tried to coax him out of his crypt with a flash of your neck or a near-death situation that requires him to save you at the very last possible moment? Have you ever considered what it will be like to introduce him to your mother? Even though your vampire’s skin is transfixingly translucent, he can still be very hard to read. Sometimes he’s simply holding back his true feelings, resisting the urge to bite you in the chance that one day you will truly love him. And other times . . . well, he’s just not that into you. How can you tell? Undead dating specialist Vlad Mezrich has all the answers, utilizing quizzes, Top Ten lists, language analysis, real-life (and real-death) testimonials, and fancy charts to show you what you need to do in order to get your vampire and keep him forever. Once you go vamp, you never decamp – so let this eternally rewarding book show you the way to the vampire of your dreams. The sequel to last years's Skinned. Visit the author's website here and read an excerpt of Crashed here. Before the accident, Lia Kahn was happy. Before the accident, Lia Kahn was loved. Before, Lia was a lot of things: Normal. Alive. Lia no longer believes in before. Six months after the crash that killed her, six months after being reborn, Lia has finally accepted her new reality. She is a machine, a mech, and she belongs with her own kind. It’s a wild, carefree life, without rules and without fear. Because there’s nothing to fear when you have nothing left to lose. But when a voice from her past cries out for revenge, everything changes. Lia is forced to choose between her old life and her new one. Between humans and mechs. Between sacrificing the girl she used to be and saving the boy she used to love. Even if it means he’ll hate her forever. Looks like some good titles SciFi. LOL, The vampire is Just not That into you sounds funny. I have Hush, Hush on my preorder list. For the past few months, I've really been getting into YA! I read Skinned, the sequel, and it's good and I can't wait to receive Hush, Hush. I've been hearing a lot about Hush, Hush. It's suppose to be pretty good. Can't wait to see what you think. Great stack of books you got there! I have Hush Hush sitting here on my TBR...probably going to dig into it this week sometime (hopefully)! Elnice The Vampire is Just not That Into You is a cute little book full of fun little articles, quizzes etc. Something you can pick up again and again. Would be fun to read out loud at parties. Wendy I just finished the audio book version of Skinned. Pretty intense. Definitely looking forward to reading Crashed. Jackie I really have to knuckle down and get caught up on my reading. I have heard lots of good things about Hush, Hush too. Falling Off the Shelf I too am ever hopeful that I can get caught up. Grrrr. Those look incredible-a bunch more for my TBR list.